Like many others lauding Peter’s teaching, Kevin Mayner remembered “the grace and maturity of his teaching style and his determination to hold students to perform at the highest levels, while giving them the means to do so.” Tae Sakamoto remembered a teacher who was “talented, kind hearted, witty, and generous” (and the first person to teach her that Hendrick’s gin goes great with a slice of cucumber!). Peter took on important administrative roles in the department and was always keen to help with governance. 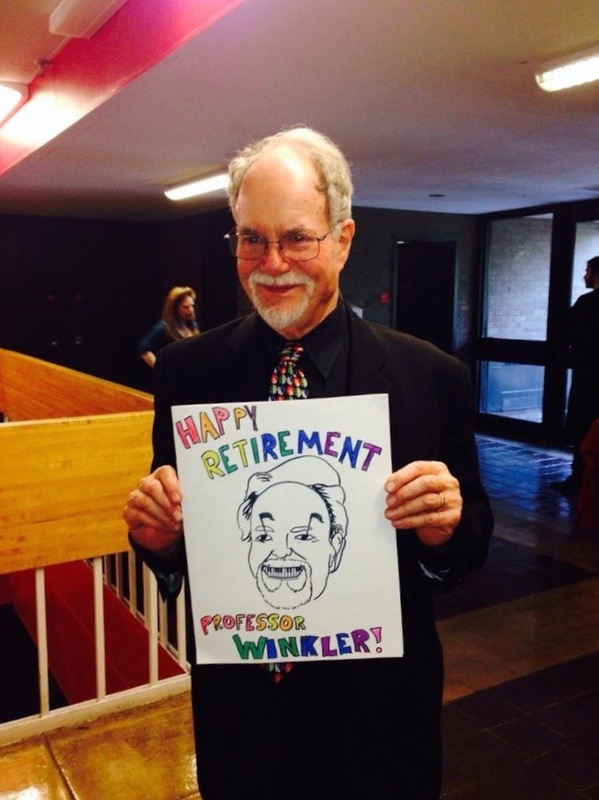 He served ably for many years as Undergraduate Studies Director and Graduate Program Director. There are, however, lots of smart and talented people in academia. What comes through in the recollections is an appreciation of Peter’s generosity and humanity, what Linda Sinanian called Peter’s “extraordinary heart, mind, and soul,” what faculty colleague Tina Dahl called Peter’s “egalitarian, compassionate, open-minded view of the world, of music, and the musicians who make it.” Several people reflected, like Jeffrey Marcus, on Peter’s “richness of spirit and humble generosity,” and colleague Joseph Auner remembered Peter’s presence as a “master learner” in his seminars and his humility in endlessly pursuing knowledge. In his last year before retirement, Peter graciously consented to serve as Undergraduate Studies Director, a role he reprised from long stints earlier in his career, just as he spent many years as Graduate Program Director, specifically, and in department governance, generally. And I can say that so much of the spirit of the department—its warmth, collegiality, generosity with students and the value it places on mentorship, the very ‘vibe’ of a place that is just fun to be around—has been stimulated by Peter’s endlessly positive energy and good nature. I asked Peter to reflect on his time at Stony Brook, and he begins by writing that he never expected to be here more than a few years. Forty-three years later, he has the following to say about his experience at Stony Brook! I remember, when I first joined the Stony Brook music department, thinking that it was a nice first job, a stepping-stone to something else. It turned out that I had been extraordinarily lucky: I had stumbled into the beginnings of what was to become a remarkable institution. “Institution” – somehow the word feels too impersonal; at times I feel our department is more like a family. More recently, I’ve begun to wonder if it’s really a kind of organism – a living, breathing entity, something that is more than the sum of its parts. This organism has its memories, though the earliest memories tend to fade as those who lived through the early days become fewer and fewer. I think it’s important to keep some of these memories going. So I want to share with you a few glimpses of my own narrative, and remind you of some of the people who built our department into what it is today. Billy Jim Layton, our first chairman, had a large part in shaping the vision of our department: it was Billy Jim who wanted our focus to be on the music of today, and to emphasize scholarship and performance in equal measure. 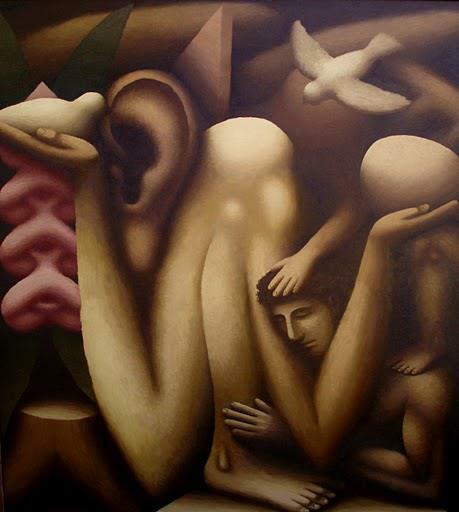 The person I remember with the greatest fondness is David Lewin. David had taught at Berkeley when I was an undergraduate there, and he was instrumental in hiring a number of Berkeley people in the early days of the Stony Brook department – our ambition was to be the “Berkeley of the East” -, including the violist John Graham; Sally Fuller, who retired the year before I did; and David Lawton, who is still with us. It was David Lewin who designed the unique system of doctoral contracts that enabled the students to have a voice in planning their curriculum and plotting their future. David Lewin was one of the most influential music theorists of his generation. But more than that, he was a deeply wise and compassionate man. Performers and Academics often have very different ideas of what a music department should be, and this tension has often torn departments apart. We faced those issues at Stony Brook, and continue to, but I remember David at meetings as the voice of reason, cutting through heated arguments and assumptions of entrenched positions, clearly and logically stating the issues, and pointing the way to solutions. He was so important in establishing an atmosphere of cooperation and sympathy between performers, musicologists, and composers that continues today, and still distinguishes Stony Brook from many other music schools. Billy Jim Layton and David Lewin may be just names to most of you, but it’s important that we remember them, along with other founders of our department who have passed on: Isaac Nemiroff, Sam Baron, Julius Levine, Tony Bonvalot, and, to me the finest composition teacher we ever had, Bülent Arel. And we must remember those who played important roles at Stony Brook but moved on to other schools: Leo Treitler, who was a brilliant and imaginative chair during the 1970’s and 80’s; Richard Kramer, who rose from music department chair to Dean of the Arts and Humanities; Joe Auner, who left us for Tufts just a few years ago, and, of course Sarah Fuller, perhaps the wisest of them all. 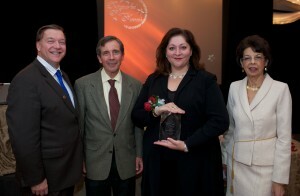 And we are lucky enough to still have some of that first generation among us – Gil Kalish, David Lawton, Daria Semegen. As for me, I often joke that I had begun as the “house hippie” and ended up as an “elder statesman.” I began teaching full of ideas and enthusiasm, but with not much of an idea of how to convey that to my students. I had a good time with them – maybe too good of a time. I hung out with them, partied with them. But it took three or four years before I felt I really began to understand what it meant to be a good teacher. In the early years, even though I felt the department supported me, I felt very much alone in trying to incorporate popular music into my teaching. I think my Rock music class, Music 109, was one of the first such courses in the country when I began teaching it in 1972. By the mid-1980’s I was no longer alone – I had joined the International Association for the Study of Popular Music, and began connecting with colleagues all over America, Europe, and even Africa who shared the belief that the study of popular music was important. By the early 1990’s I had a number of colleagues here at Stony Brook who saw the importance of popular music – Dan Weymouth, Joe Auner, Jane Sugarman. And now we can boast a number of Stony Brook PhD’s who have built careers on popular music studies – Jason Hanley, the education director at the Rock and Roll Hall of Fame, and Theo Cateforis, who is now sending new graduate students to us. Along the way, of course, I took on some of the administrative work of the department. Leo Treitler appointed me Undergraduate Director in 1976, even before I was up for tenure – a shrewd move on Leo’s part that undoubtedly helped my case, and, more importantly, propelled me into a deeper sense of responsibility toward my department. In the 1990’s I became the graduate director; in the first year or so I worked under Sarah Fuller, who was a gentle but firm mentor who taught me a great deal about integrity and upholding the standards of the department. This past year I gave a final bow as undergraduate director – a parting gift from Perry. Once or twice I’ve been asked to consider being chair, but I know myself too well – I’m a good lieutenant but a lousy general. I loved teaching, but 42 years is enough. What I’ve always felt I needed to be doing is writing more music. I’ve written some music I’m very proud of – my enormous Humoresque for piano solo, my waltzes for piano trio, my serenade for strings, and several shows, especially the musical “Out” that I wrote with my dear friend Winston Clark for the Connecticut Men’s Choir. Most recently I was very happy with my opera, Fox Fables, which received a stunning production here at Stony Brook a few years back. But I need to write more before it’s too late. I also need to take better care of the music I’ve already written. Since retirement, I’ve had some marvelous Stony Brook performances of my work – an all-Winkler concert in October 2014 featuring pieces dating from 1965 to 2014; the premiere of a new piece for the Stony Brook Wind Ensemble, and in March 2015 Eduardo Leandro conducted the Stony Brook Symphony in a revised version of my massive Symphony, first performed for the dedication of the Staller Center in 1979. And to the people who have said “we will miss you” I always reply “I’m not going anywhere.” You see Sally Fuller at school almost every day, and you’ll be seeing me, too – at concerts, colloquia, and at last I hope to fulfill my dreams of sitting in on my colleagues’ seminars. So this is not goodbye at all; just hello to a new stage. Late summer, 2012, my wife and I went to Sag Harbor, where we rarely go, with a couple with whom we never spent time, to the American Hotel, where we had never been. As we walked up the stairs to the American Hotel, one of the couple nudged me and said, “that’s Billy Joel.” I walked over to him, apologized for intruding, told him I was the new chair of the Department of Music and thanked him for the Baldwin grand piano he gave the department back in 1993. “Hmm,” he said, “I keep hearing good things about the Music Department at Stony Brook. I might have another piano for you.” He gave me the name of a contact in his office. When I got back to campus, I called Katie Stockhammer, who assists with fund raising for the arts, and joked with her about how easy it is to get donations. “You just shake somebody’s hand, say hello, and they offer you a piano,” I said to her. Ten months and a lot of legwork on Katie’s part later, we had a piano delivered. But not just any piano. It was a Bösendorfer Imperial Grand, valued at $250,000. It’s a piano with nine extra keys extending the bass, and it’s so big that it just cleared the Recital Hall’s doors by about an inch and a half on each side. “The Department of Music wishes to nominate the singer, songwriter, and pianist Billy Joel for an honorary degree. A native of long Island, he is one of the most successful recording artists in the history of American music, and a songwriter of great talent and originality. “Billy Joel’s stature in the world of popular music is partly measured by his record of 33 Top 40 hits and sales of over 150 million records worldwide. [In 2013], he was one of the honorees at the Kennedy Center, and has also been inducted into the Songwriters Hall of Fame (1992), the Rock and Roll Hall of Fame (1999), and the Long Island Music Hall of Fame (2006). This year’s distinguished guest commencement speaker was Fred Bronstein (D.M.A. Piano Performance, 1987). 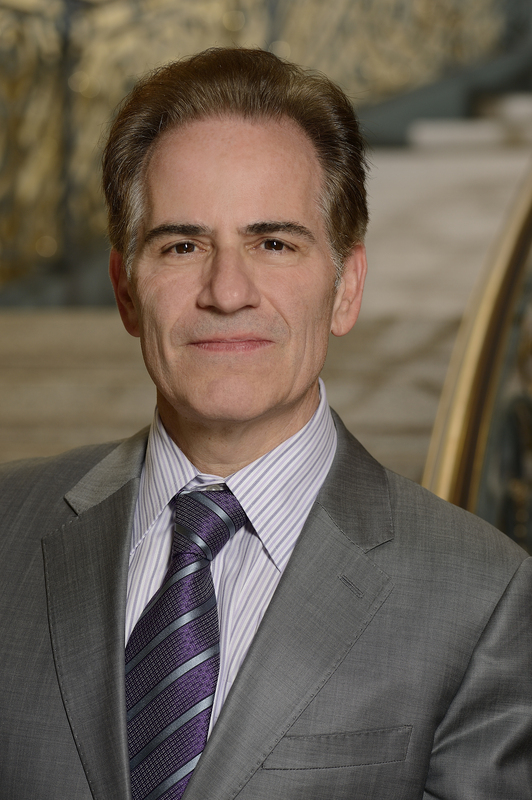 Founder of the contemporary music ensemble Aequalis, which toured and recorded for eight years, Dr. Bronstein went on to serve as president of the Omaha Symphony and Dallas Symphony Orchestra, before becoming the president of the St. Louis Symphony from 2008 to 2014. During his time in St. Louis, he reversed financial declines in ticket sales and philanthropy, resulting in a 36% increase in ticket revenue and a 26% rise in philanthropic donations. 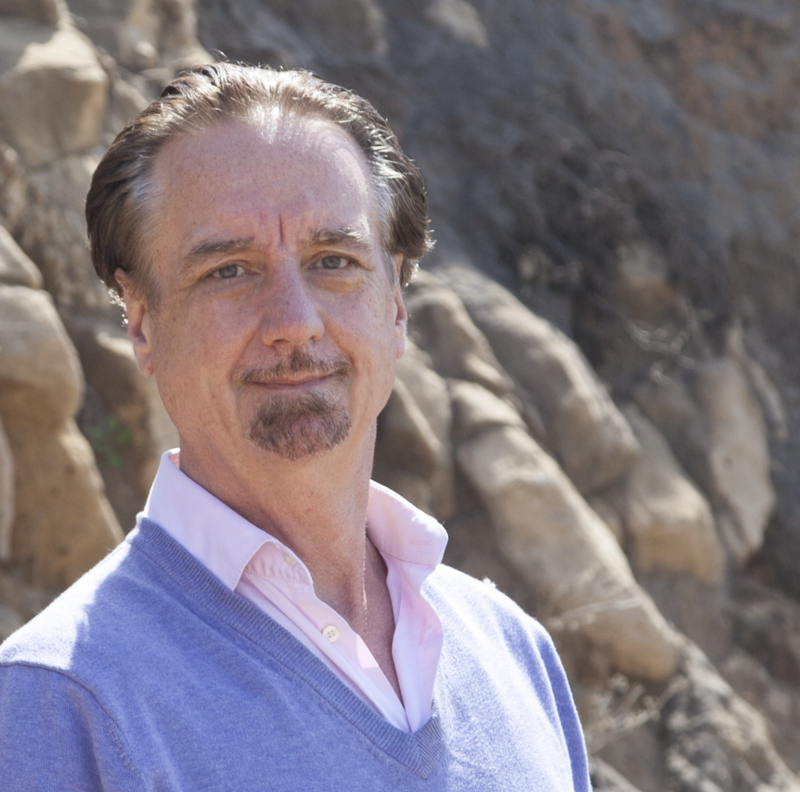 In June, 2014, he was appointed Dean of the Peabody Institute. We are grateful to Dr. Bronstein for his visit and for sharing his thoughts with us. Here is the text of his commencement address. 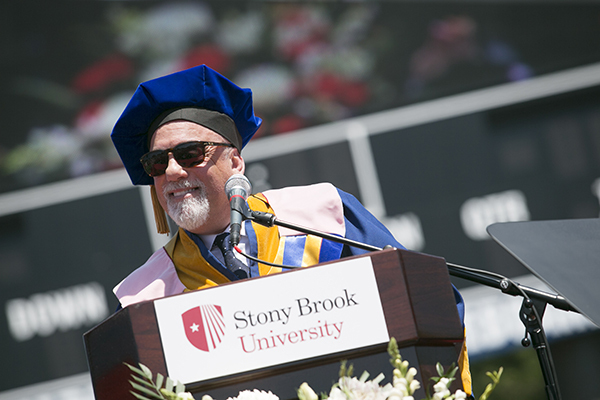 I want to begin by congratulating each and every one of you on your graduation today from Stony Brook. You should be proud. Your family and friends are proud of you. You worked hard to get here. The good news is that you were successful. The challenge is, OK, “what’s next?” We asked that same question about classical music in a symposium at the Peabody Institute this past fall. To talk about “what’s next” for you, we should return to that same question, because what’s next for you is inextricably linked with the future of your chosen art form. Movies such as “Carnegie Hall” and Fantasia, where Mickey Mouse stepped up to shake the hand of Leopold Stokowski, introduced classical artists to the public. In fact, for a while, it seemed like classical music was consistently finding its way into popular culture. So what happened? Was it the well-documented and lamented decline of music education in schools? Life-style changes? The advent of new and different forms of communication and media? Did these all contribute to this decline in people attending classical concerts as demonstrated by a National Endowment for the Arts study which showed over the first decade of the 21st century a 25% decline in adults attending at least one classical event annually? Do I have your attention now? What this really means is that the 21st century “classical” musician has to be more than a great pianist or violinist, more than a great performer. As you embark on your musical life after Stony Brook, you will need to relate, educate, spark interest and creativity, engage an audience, and yes, entertain. I started to think about this nearly 30 years ago as a doctoral student right here at Stony Brook where two colleagues and myself co-founded Aequalis, a group dedicated to performing and advancing contemporary music. By necessity, we thought a lot about how to connect to audiences. To be sure, what we wanted to do was play the music really well, and introduce people to new sound worlds and the music of living composers. But we approached it from the perspective of how to create an audience for what we were doing through whatever means possible. When I began to work with orchestras, it had already become clear that we needed to do something different in our business. That meant offering new and different kinds of music. It entailed linking the orchestra with popular mediums including film and video game shows. It involved taking an active role in education, and embracing our communities in new ways. And most importantly, it meant finding new avenues to identify, interact with, and relate to audiences. Because at the end of the day, people want to be on the “inside”; they want to relate; they want to interact; they want to be involved. Think about the fact that today anyone can participate in a very direct way in activities previously left to a few. Anyone can “publish” a book. Anyone can be on “TV” – it’s called YouTube. Anyone can be a columnist – start a blog. Anyone can be a celebrity – how many followers do YOU have on Twitter? People want to be involved, and in the know. In the performing arts world, that means they want to be close to the artist. They want an intimate experience and a sense of participation. Examples of this are increasingly prevalent. Think about Poisson Rouge in NYC – a kind of night club for classical music. Or the You-Tube symphony which brought together artists from around the world for an internet premiere of a new work. The Baltimore Symphony’s “Rusty Musicians” program lets amateur musicians sit side by side with BSO members in a kind of orchestra “fantasy camp.” Or the New World Symphony’s “Emotion Meter” cell phone experiment, where audiences participated in a performance by registering via cellphone in real time the emotions they were experiencing through the music. These are all examples of the classical music world you are entering. For the Peabody Institute, that means expanding our vision to make four pillars central: Excellence, Interdisciplinary focus, Innovation, and Community Connectivity. All of these are critical although the “community” aspect is arguably the most critical. Because that’s where this notion of musicians not just being musicians but being advocates, educators and connectors becomes central. Yes, we need to educate artists that are at the top of their game as performers as a starting point; but we also need them to be smart, holistic, and creative. As graduates, embrace this notion of experimentation. Never stop looking for ways to educate, advocate and connect. You don’t know where your lives and careers will take you. Be open to anything; stay flexible, and follow your heart. I’ve always found it ironic that in our country “classical” music is where people often turn for emotional comfort and reassurance in times of distress. We were reminded of this and the importance of music in our communities with recent events in Baltimore. Music is uniquely human in its expression of ourselves and how we see the world. The exciting thing about all this is that while in some ways classical music has never been more challenged, in many ways there have never been more avenues to make connections through classical music. I’m confident that now having survived over the centuries, the geniuses that populate music history will continue to be with us. And I know that with your unique talents and abilities, you’ll bring new energy and creativity to our art form in a way that will build on and strengthen its history and serve the world in new and different ways. Again, congratulations to you all. Thank you and enjoy this wonderful day. When students decide to study music on the collegiate level, whether as undergraduate or graduate students, their focus as they determine whether to attend a conservatory, college, or university is generally on the musical offerings at these institutions. Choosing a university, as many students have discovered here at Stony Brook, has unanticipated benefits. Students who attended Stony Brook University can be proud to have attended a world-class research institution, where students and faculty have the resources to participate in innovative interdisciplinary collaborations. In 2001, Stony Brook was invited to join the Association of American Universities, in recognition of the university’s breadth and quality of its program of research and graduate education. The members of the AAU are regarded as the 62 most prestigious research institutions in North America. Membership is by invitation, and an invitation is only extended to a university when three quarters of the current members approve, after an extensive review of the nominated institution’s research and academic programs. Making the most of Stony Brook’s breadth of research, students and faculty in the Department of Music have engaged in a variety of interdisciplinary collaborations. 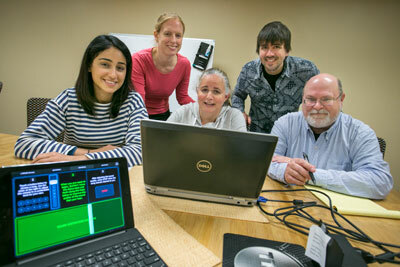 Some recent events have included conferences, colloquia, an outreach concert, and a promising app for therapeutic assistance with Parkinson’s disease. Yerin Kim, a current DMA candidate in piano, hosted a concert created specifically for children on the autism spectrum and their families. Kim worked with gifted students with autism in prior studies at Indiana University. She drew on the expertise of faculty in the School of Social Welfare and the Department of Psychology to create a welcoming place for people on the autism spectrum. Stony Brook University has long boasted strong departments of music and philosophy, and these departments have a long standing friendly relationship. 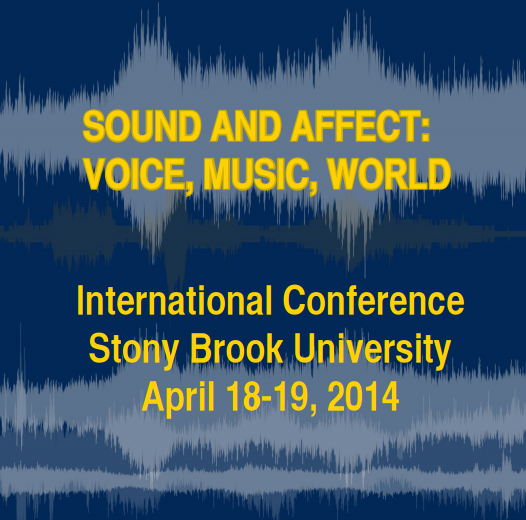 In Spring 2014, the departments jointly organized the international conference entitled “Sound and Affect: Voice, Music, World.” The organizers from music were Stephen Smith and Judy Lochhead. Graduate students assisted during the conference, and students and faculty from music were accepted as presenters from a field of highly competitive applicants. Speakers hailed from throughout the Americas and Europe, and plenary sessions concluded both days. The conference was thoroughly interdisciplinary, involving scholars from at least ten departments. The conference aimed to foster dialogue among scholars from across the humanities, and this ongoing goal will be fostered by the upcoming publication of an edited collection of select essays from the conference. Also slated for the 2015-16 academic year is a series funded by a Faculty in the Arts, Humanities and Social Sciences grant awarded to Honisch, along with faculty in History, and Hispanic Languages and Literatures. 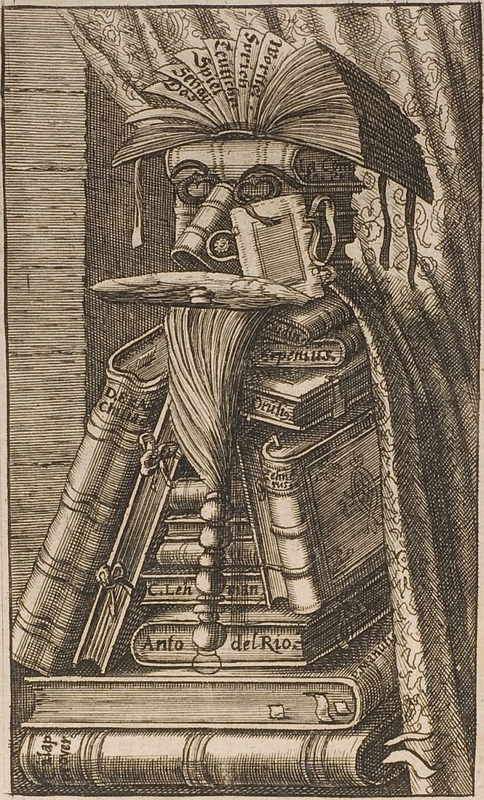 The series is on “The Book,” defined capaciously, and will feature talks by Adrian Johns, Kate Van Orden, and Jésus Velasco. Of the upcoming events, Honisch says, “For musicians and musicologists working in the Western classical tradition, our most tangible connections to what we play and study lie in the physical objects that transmit notated music. Where traditional disciplinary boundaries often relegate music books to the margins of scholarly discourse, this grant makes it possible for these links to our musical past to take center stage alongside the artifacts of other kinds of written practices, and for faculty and graduate students to model cross-disciplinary conversation at the research university.” As part of each talk, graduate students will have the opportunity to workshop works-in-progress and prepare questions for the speakers. 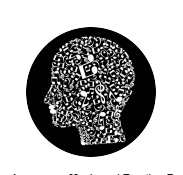 Since 2012 LaMERG has established a permanent reading group to discuss cutting-edge research that bridges psychology, linguistics, and music. They have also hosted annual workshops, attended by students and faculty from nine different departments. Though Conklin is the only LaMERG organizer from Music, the group has invited many outstanding music scholars, including David Temperley (Eastman), Fred Lerdahl (Columbia), and Carol Lynne Krumhansl (Cornell) to speak as part of their workshops and distinguished speaker series alongside other top scholars in Linguistics, Psychology, and Cognitive Science. *The stories on Jay Loomis and Yerin Kim originally appeared in an article by Glenn Jochum. 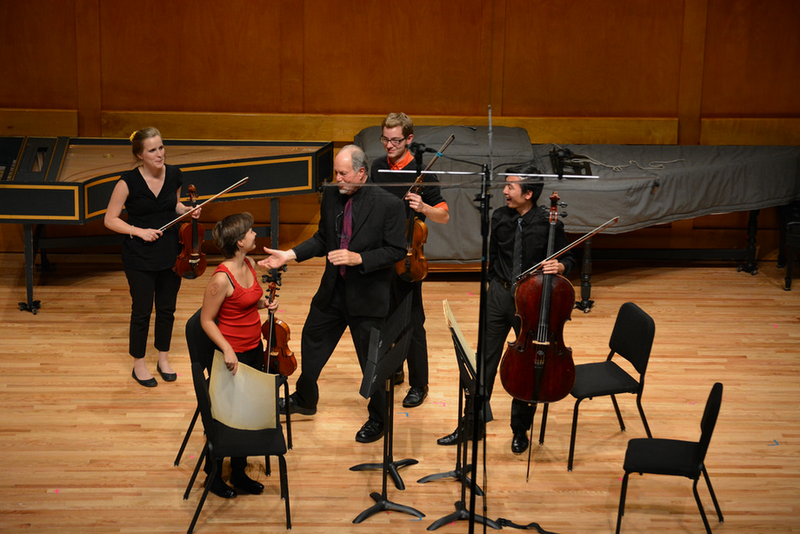 Fall 2015 marks the middle of the Calidore String quartet’s residency at Stony Brook. The quartet was selected by the Emerson String Quartet, to both join them as members of faculty, and to be mentored by them for the academic years 2014-15 and 2015-16. The Calidore Quartet is the most recent promising young quartet to earn this honor, and follow in the path of the St. Lawrence, Artemis, Avalon, Calder, Pacifica, Ying, Borealis, and Escher Quartets, all of whom have been mentored by the Emerson Quartet. 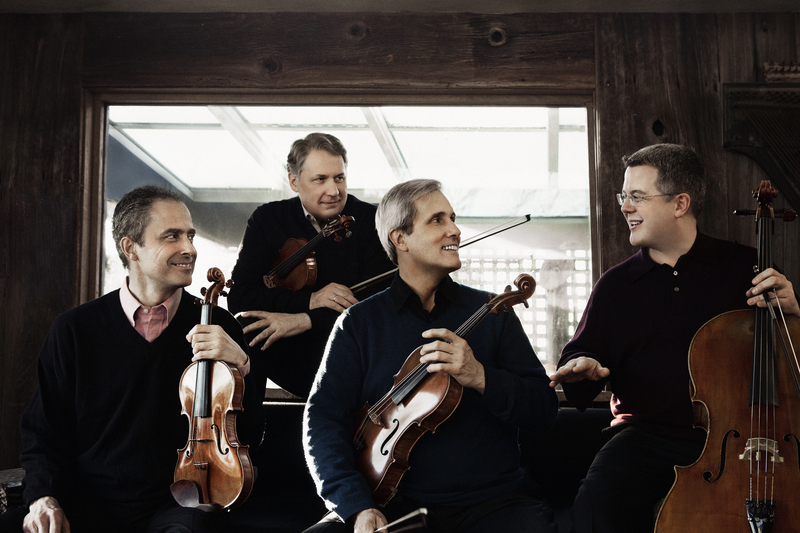 The new residency and the Calidore’s accomplishments were the subject of a feature article in the May issue of Strings magazine—fellow Emerson mentees the Calder Quartet were the cover story of the same issue. 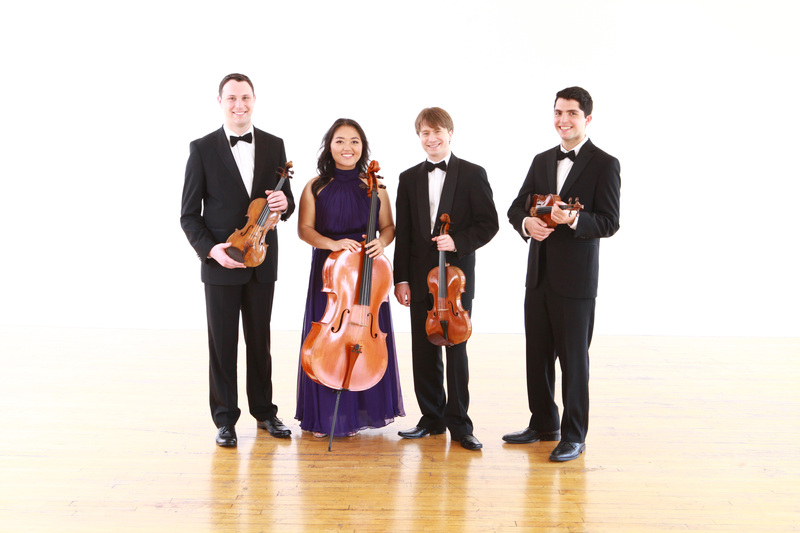 Jeffrey Meyers, Ryan Meehan (violins), Jeremy Berry (viola), and Estelle Choi (cello) came together to form the Calidore quartet in 2010 while students at the esteemed Colburn Conservatory of Music in Los Angeles. Since then they have established themselves as one of the world’s most illustrious young quartets, winning grand prizes in practically every American chamber music competition, including Fischoff, Coleman, Chesapeake, and Yellow Springs, and capturing top prizes internationally at the Munich International String Quartet Competition and the Hamburg International Chamber Music Competition. The young quartet is quickly making their mark, having made their debuts at prestigious summer festivals including Verbier, Ravinia, Banff, this year serving as Quartet-in-Residence at the Bellingham Festival of Music, and the Innsbrook Institute Summer Music Academy and Festival. They have appeared in chamber music series at Lincoln Center, Wigmore Hall, Seoul’s Kumho Arts Hall, the Flagler Museum, Shriver Hall, the Phillips Collection, Schneider Concert Series, and the National Arts Center (Ottawa). They have collaborated with many of today’s leading artists, including Menahem Pressler, Joshua Bell, Jean-Yves Thibaudet, Paul Coletti, and Quatuor Ebene, among others. Their two years at Stony Brook will see the Calidore through a number of firsts. Their first commercial album was released in February 2015, and they will make their Carnegie Hall debut on May 10th, 2016. Their debut album features Mendelssohn’s String Quartet No. 2 in A minor, Op. 13 (one of the first pieces they read together as a quartet), and Haydn’s String Quartet in C major, Op. 76, No. 3, “Emperor.” They are releasing a second album this year, on Editions Hortus, commemorating the World War One centennial. Their Carnegie Hall debut is sponsored by Stony Brook. 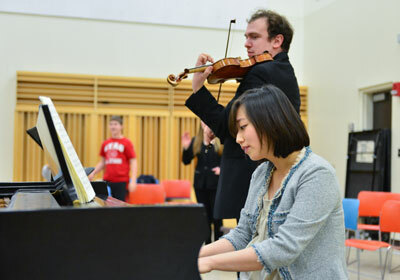 Besides performance opportunities, the residency at Stony Brook includes education commitments. The Calidore quartet are committed to education and have conducted numerous pre-concert talks, post-concert Q&A’s, classroom visits, public school assemblies, traditional master classes and multi-day community residencies. At Stony Brook they will take part in outreach programs in Long Island schools funded by the Staller Educational Outreach Endowment and the Barbara N. Wien Endowment for Arts & Education, and coach undergraduate chamber ensembles on campus. Their commitment to education continues into the concert hall—their first lesson with the Emersons was on programming, and has resulted in programming that aims to enlighten audiences in a traditional concert setting. One example is their “French Quartets Through Time,” with works by Hyacinthe Jadin, Dutilleux, and Debussy. by music on September 23, 2015 . 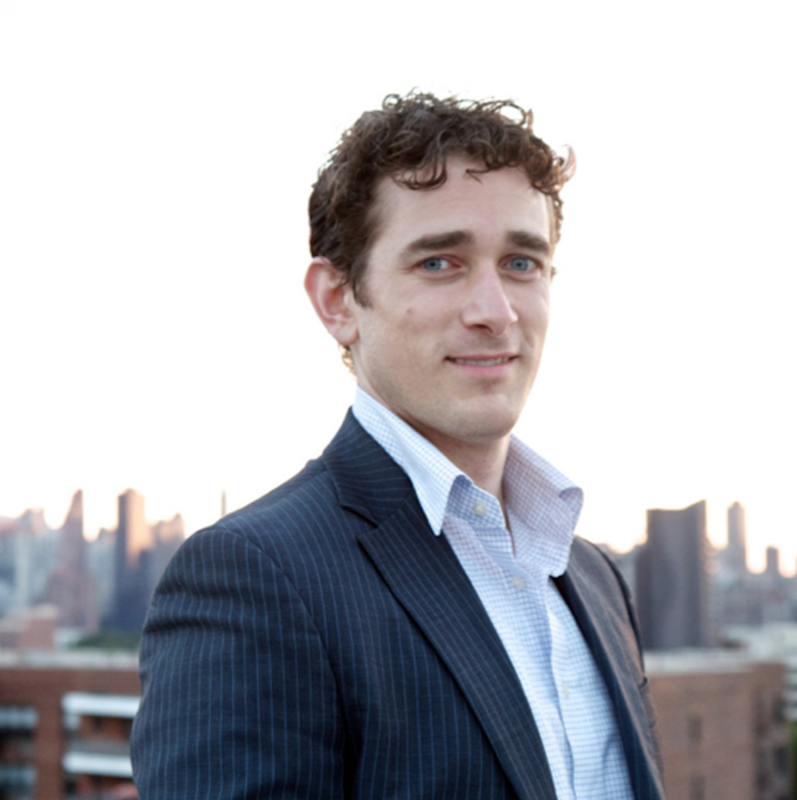 While the vast majority of Department of Music alumni attended as graduate students, it is two undergraduate alumni, both of whom hail from Long Island, who are going from success to success in the world of opera. Christine Goerke earned her BA in Music under the tutelage of Elaine Bonazzi in 1994, and Christian Van Horn earned his with Richard Cross in 2000. Today, both are singing major roles in prestigious opera houses around the world. When Christine Goerke began her undergraduate studies, she had a very different career in mind; she was an education major, concentrating on clarinet, at SUNY Fredonia. This only lasted one semester, followed by one semester at Suffolk County Community College, before she moved to Stony Brook. She had already started to become interested in singing while at Fredonia, and this became her focus once at Stony Brook. Professor Emeritus Peter Winkler remembers her in a theory class, where she was particularly entranced by Marie’s lullaby in Wozzeck. When she expressed a desire to sing it, Peter remembers thinking, “Oh, isn’t that sweet; this undergraduate would like to sing Marie’s lullaby.” She soon proved, if not quite yet up to the task, that she was in possession of the raw material that would blossom into the dramatic soprano she has become. While at Stony Brook, David Lawton cast Goerke to sing Asteria in Handel’s Tamerlano and Fiordiligi in Mozart’s Così fan tutte – a role she later sang in the Houston Opera opposite operatic lyric-coloratura mezzo-soprano Joyce Di Donato. 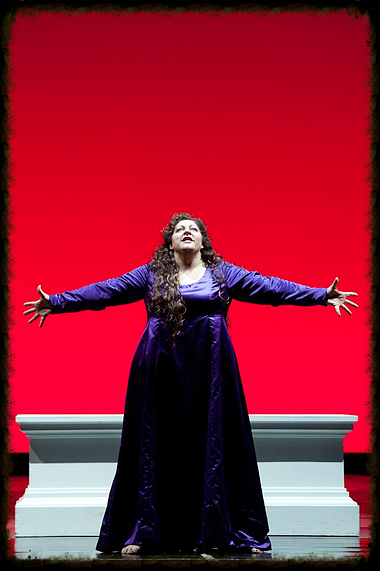 Of his casting choice, Lawton said, “Normally we would not cast an undergraduate in a leading role, but her talent was exceptional and extraordinary.” Upon graduation, her talent was noticed and nurtured in the Metropolitan Opera’s Young Artist Program, and she joined the company’s roster as a soloist in 1995. Her career has progressed like a fairytale – she was a rising star in the late 1990s, singing Mozart, Handel, and Gluck; she received American opera’s highest honor—the Richard Tucker Award—in 2001. But trials soon followed. Early in the 2000s, she became uncomfortable in her voice. She sought out vocal coach Diane Soviero, who pinpointed the source of her discomfort – a separation from her support. As Goerke reconnected with her support, the voice that emerged was her new, much bigger soprano, ready to tackle Strauss and Wagner. Challenges overcome, she is going from strength to strength, with highly-praised performances, especially of Die Färberin in Die Frau ohne Schatten at the Met, where she received one of the biggest ovations in recent years, and soon after was booked to sing Brünnhilde in the 2018-19 season Ring cycle. This summer, her engagements have been for concert performances. In June, she sang opposite Simon O’Neill in Wagner Gala with the New Zealand Symphony Orchestra (who employ at least three Stony Brook alumni as regular casual players[i]), under Pietari Inkinen. In August, she is soprano II for Mahler Symphony No. 8, with the Boston Symphony Orchestra (who employ at least one Stony Brook alumni[ii]) under Andris Nelsons at the Tanglewood Festival. Christian Van Horn sang from an early age – in church choir, then in school musicals (which, by his own admission, he initially participated in to meet girls). Though he got started singing when he was young, it was not until he got to Stony Brook that he was exposed to opera, and found a suitable home for his deep, resonant voice. His one and only voice teacher was Richard Cross, first at Stony Brook, then at Yale where he completed his Master of Music and Artists Diploma. Of Cross, Van Horn say, “I study with him to this day. He provided me with the solid foundation on which my technique is built. He brought his world class experience and expertise to my lessons every week and gave me all of his time. Trying to soak up as much as I could, I learned as much out of the lesson room as in [it], and he graciously entertained my endless questions. He was the one that instilled in me my work ethic, which is essential to success as a musician and never has a day passed since that I don’t get my work done.” It was Cross who told him that he thought he could sing opera for a living. “We spent many hours together and I endlessly grilled him about the business and singing as a profession.” Cross’s experience, encouragement, and professional know-how paid great musical dividends for Van Horn. Following his time at Yale, Van Horn was a member of the Ryan Opera Center with the Lyric Opera of Chicago for two years. He remains a favorite there, and also at the Bayerische Staatsoper, where he was on the ensemble roster for two years, and with San Francisco Opera, where, in the 2014-15 season alone, he was in six different productions. He has also made house debuts throughout Europe and the U.S., including his Met debut in 2013. He is establishing himself in signature roles, such as Colline in La Boheme, which he has sung in 13 productions, and widely praised for his performances of “Vecchia zimmara”; Figaro, which he has sung in four productions and on the Sony Classical Records album with conductor Teodor Currentzis; and the four villains in Les Contes d’Hoffmann, in which his “Scintille, diamant” has been singled out for especially high praise. Van Horn says “My time at Stony Brook was huge in my development. I was also allowed to be in the Opera Ensemble while an undergrad and sang my first roles (Benoit and Alcindor) in La Boheme with David Lawton at the podium. Stony Brook really provided me with the environment and motivation to be a musician at the highest levels.” Van Horn’s recipe for success serves as good advice. He endeavors not to be noticed, at least not for the wrong reasons. He is sure always to be on time, and to be absolutely prepared for his role, treating any role like a major lead. This summer, he finished his season with the San Francisco Opera (who employ at least four Stony Brook alumni[iii]), performing Narbal in Les Trojens and Feldmarshal in La Ciociara. In August he will be making his debut with Seattle Opera (who employ at least one Stony Brook alumni[iv]), performing Zaccaria in Nabucco. Wherever you have settled in the world, chances are one of these opera stars will be performing near you soon. Check their websites for upcoming appearances.